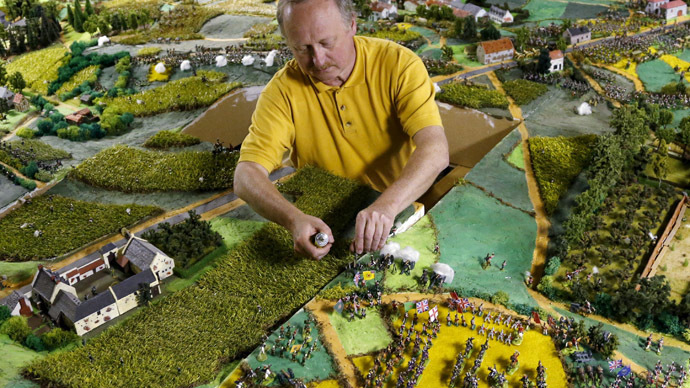 Four decades in the making, an epic 40 square meter diorama of the Battle of Waterloo has been completed by a Belgian enthusiast, just in time for its bicentenary next month. Willy Smout started his epic work in 1975, when he was 16. Now, the 1/1,000-scale model in the basement of his home in the village of Schaffen, 70 km northeast of Waterloo, includes 3,000 handpainted soldiers, including 72 counterparts of historic figures. "During the last couple of years, I pushed myself really hard to finish it," he told Reuters. "I succeeded last week." It took Smout 40,000 hours and the equivalent of 150,000 euros in work, research and expanding his home to accommodate the astounding piece, he estimated. He will be one of some 200,000 people who are expected to visit the commemoration of the June 18, 1815 battle that ended the period of Napoleonic wars and reshaped Europe. The defeat of Bonaparte's French army by Britain's Duke of Wellington and his Prussian allies is significant for Belgium itself, as the dissolution of the French Empire paved the way for the Belgian revolution 15 years later, in which several Dutch provinces seceded to form an independent kingdom.